Prophecies fail. Demons invade, living dungeons rip towards the surface, and the Empire's protectors falter. The great icons who shape the world arm for war. So what's it going to be, heroes? Risk everything to forge your own epic history? Or grab the best loot and escape into the shadows? 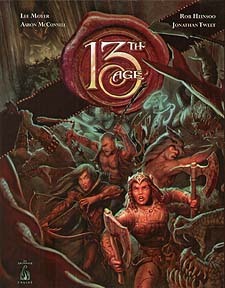 13th Age is a d20-rolling fantasy game of battle, treasure, group storytelling, and heroic adventure. Your character's "one unique thing" ensures there's no one else like you. Alliances and enmities with icons such as the Archmage, Lich King, and Prince of Shadows give your character a place in the world's story even at first level. Streamlined and flexible combat rules create fast-moving, free flowing battles. Character backgrounds let you invent the stories that shape your skills. Design monsters and adventure quickly. Surprise yourself and your players with plot hooks form characters' backgrounds and unique features. Improve any d20-rolling game with mechanics such as the escalation die and incremental advance. 13th Age: Forge heroes. Shape the world. Be legendary.